The HTC One M9 is an amazing piece of engineering device among the most advanced smartphones on the market. However, to get it to work the way you expect, the device’s touch screen has to be sensitive to the touch and transparent so you can see what is being displayed. It has become so natural now that when you buy a new smartphone, you are going to buy its screen protectors too. The screen protector is a screen guard which is thin, but tough enough to protect your phone from any scratch, scrape or dust, and also will save you money and headaches in the long run as well. Fortunately, screen protectors are cheap and easy to install. We have collected the top 5 best HTC One M9 screen protectors to help you choose the right one that will prevent your HTC One M9’s screen from scratching and breaking. Next, the amFilm tempered glass screen protector is one of the best-tempered glass models available. It made of ultra-clear tempered glass by providing 99.9% transparency to allow an optimal, crystal, and natural viewing experience. It offers a hardness of 9H which is highly durable and excellent in protecting against drops, bumps, scratches and other damages. The amFilm tempered glass is only at 0.33mm thin which is lightweight and promises not to interfere with the sensitivity of the device’s touchscreen. 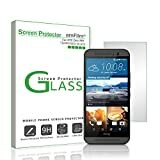 This tempered glass screen protector comes with a full kit required for proper installation and cleaning. Spigen is a well-known brand that most customers satisfied with. 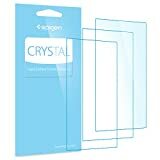 This screen protector made of crystal clear Japanese base pet film which provides a premium ultra-clear viewing experience. It has a 3H hardness that should make it survive most scratches, dust and regular sights on wear and tear. The pack includes 3 pieces of front screen protectors. This makes it much more convenient as when the existing one needs to be changed there will be another two available. It is also extremely easy to install and remove with dry application. The HTC One m9 screen protector from Dmax Armor is one of the best-tempered glass models available. It is made of highest quality tempered glass and a hardness of 9H which protects from scratches, impacts, and drops. It comes in the form of 0.3 mm thin while maintaining 99.99% HD clarity and original touch experience. An interesting fact about the screen protector from Dmax Armor is that the tempered glass has Hydrophobic and Oleophobic coating that protects against sweat and oil residue from the fingerprint, keys, and other outside objects. It also comes with a full installation and cleaning kit, makes it easy to install on your device. 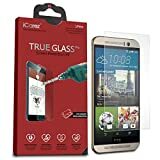 The iCarez HTC One M9 screen protector offers excellent reliability for such an affordable product. It made of high durability tempered glass that has a 0.33mm and a hardness of 9H. It can greatly absorb external force from hitting, shocking, and dropping. The surface hard coating layer can effectively resist wearing, rub, and scratch. This iCareez screen protector also features an ultra-transparent close to 100% ultimate clarity that can provide a good visual effect on your screen. The true touch sensitivity ensures the original responsiveness and accuracy of your touchscreen. To start with, ArmorSuit is one of the most popular brands in various touchscreen protector products. Their ArmorSuit MilitaryShield® technology features excellent clarity and UV protection to prevent yellowing. This screen protector also features the self-healing technology that constantly eliminates minor scratches on the film. The screen protector made of 5 protective layers which maximize protection against scratches and reduce chances of damages to your screen from drops. It comes with a full installation kit that is quick and easy to install with the bubble-free application. You’ve just seen our best screen protectors around today. Each one of the HTC One M9 screen protectors here is among the best ones you can trust and buy to protect your phone. They all have one thing in common and that is the protection of your device and ensures that it will last until you decide to trade up to a new smartphone.